But I thought I'd share what we did, as I talk about it a lot. Were I artistic and not inept, I would have filled the ceiling with what I've always called Magic Colors - all those gorgeous blues and purples that fill the night sky at twilight. And I would have began our "Big Bang" there. With an explosion of beautiful colors of stars. It is 20 meters - 65 feet - long. The stair wall begins it, at the top. 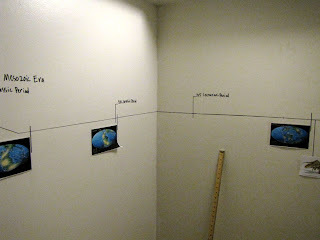 There are pics of the earth at different times, and we'll fill it in with wondrous things like when plants evolved seeds, and Sponges (they're up), and the like. 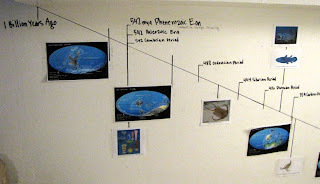 The Big Bang through the Cretaceous has been allotted 17 1/2 feet. A big section, but it's millions of years, and a big interest for us. 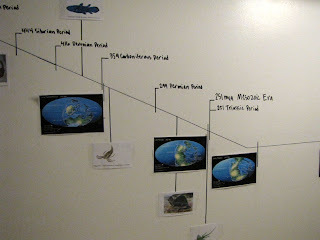 The Tertiary Period (65 mya) through the Quarternary Period (2 mya) is eight feet long. One Million (before common era) through 2700 (bce) is 6 feet. Not a lot of space length wise, but we'll move up and down as we need, and it should be plenty of room. 2700(bce) through 900 (common era) is 7 feet long. The only thing on there yet is a lonely picture of Socrates. Haven't found one of Plato yet, and haven't decided on Jesus's picture yet. Back up the stairs (9 1/2 feet) is for the 20th and 21 centuries - we'll have historic events, as well as family history, and special dates in our lives. I think that for the people, we may mount (frame) them on black cardstock, and on a white piece of paper in the back give specific stats - such as "won the nobel peace prize for___ in _(date)__" and that sort of thing. We'll just tape the top, so that we can flip it up to read the notes, maybe. Amazing! 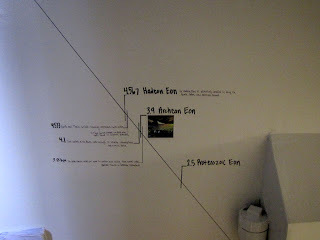 We rent so we can't write on the walls, and besides that, we don't have any long stretch of wall that doesn't have anything on it. That is insanely awesome! Love it!! Wonderful idea. We are unschooling our kids and I always appreciate good ideas like this. So cool! I don't have the wall space as it to hang up our second world map (political vs. geographical) so we have to take it out every now and then and spread it on the floor. If I did have the wall space though, I think I'd fill it with a diagram of the plant families with photos of all the plants we identify organized within. Just dreaming, mind. A fascinating and rewarding project. Endless possibilities! I like how big your timeline is. Very nice. We've been working on one too. The kids love it. coolest thing ever. You are my timeline goddess! Very cool idea! 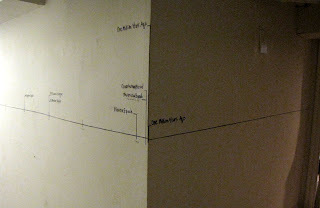 I always try to make timelines on paper and hang them on the wall but they inevitably fall off. Next time I'll put it right on the wall! That is so neat! Where do you have this? Just all over or on a specific area of your home? I love it! Incredible! Thank you so much for sharing this with us. I love how you set this up and love that you're not "afraid" to put it on your walls. It's such a great visual that will organize history in a manner that your little ones will remember for the rest of their lives. I think the hardest part would be determining the amount of space for each time period. 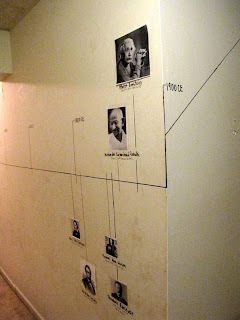 We are going to try this, now to clear some wall space! Thanks again for sharing this, you are such an inspiration. it's in our basement - running down the stairway, around the hall, then coming back up the stair way for the 20th and 21 centuries. Lisa - that was the hardest part, I think. Wow, that is so cool! And what a great way to learn history!